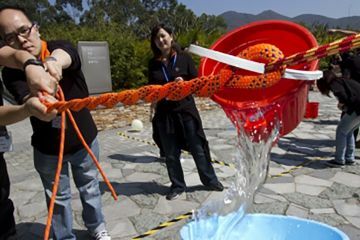 As part of their Chinese New Year celebrations, the sourcing arm of Europe's leading home improvement retailer, Kingfisher were keen to participate in an appropriately themed celebratory team building activity. Creative, music and dance team building experience, Dragon Squad was the ideal choice! After a short presentation of the importance of the Dragon to Asian culture, the KSO Hong Kong team were divided into twelve teams and given plans to a create a Chinese Dragon. The teams got to work planning and allocating roles. Team members began assembling the head and tail of their massive creature. Eyes, eyelashes, teeth and a moving jaw were glued together. After constructing the dragon head and tail the decoration began. By adding paint, colour and each team’s own unique flair personality of mythical creature came to life. A series of music and choreography workshops were held concurrently with representatives from each team responsible for music selection and creating dance moves for the Dragon Dance. 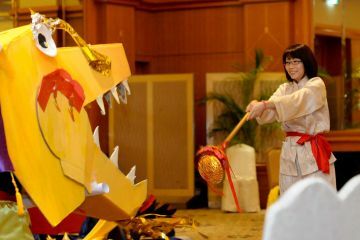 Team leaders ensured their team members will align with the delivery of the dragon dance for the rest of the team with prizes of Best Team Performance and Best Decorated Dragon. Next, the teams practised bring their Dragon to life with a modern twist on a traditional dance. Energetic and symbolic Dragon Dance is a blessing to bring luck and fortune for the coming year.